Yanmar Construction Excavators: Click here to view the models. Yanmar Skid Steers: Click here to view the models. Welcome to Agroland Equipment & Supplies, the Austin equipment experts! We are a local, veteran-owned and operated equipment & supply store, and service center located in Spicewood, just twenty minutes from downtown Austin, in the beautiful Texas Hill Country. We provide services and support to the rapidly growing Spicewood community, Austin, Lakeway, and surrounding areas. 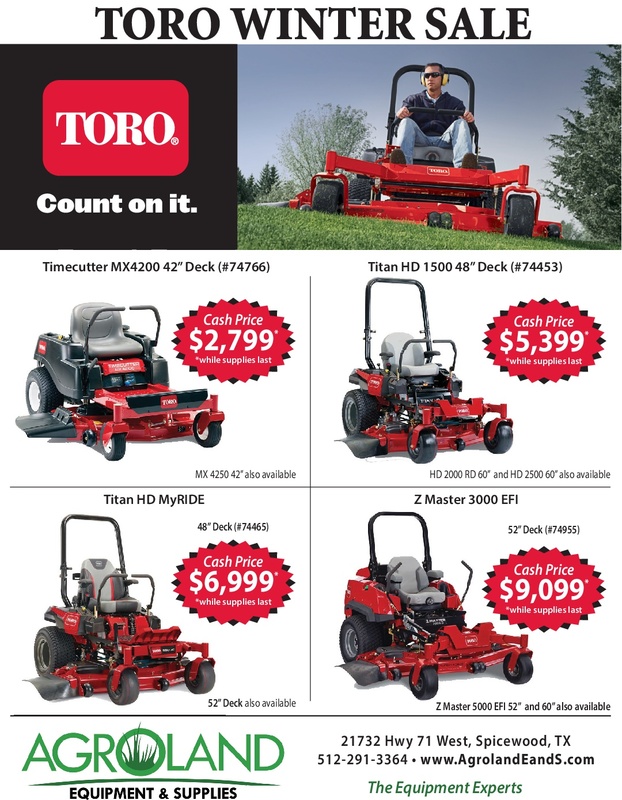 We sell tractors, UTVs, JSVs, articulating mini-loaders, excavators, skid steers, commercial and residential lawn mowers, diesel generators, hand-held maintenance equipment, feed, fertilizer, tree and turf chemicals, etc. Cub Cadet, Echo, Gravely, Grasshopper, Maruyama, MultiOne, SCAG, Shindaiwa, Toro and Yanmar are some of the premium brands you will find at Agroland. Each piece of equipment in our showroom has been carefully selected to meet the tough demands of the Hill Country terrain. Our knowledgeable Parts and Service Department will service and repair your outdoor power equipment. We service most ATV and UTV brands. Our shop uses premium quality products like Schaffer’s lubricants, we use genuine Kohler, Kawasaki and Briggs & Stratton parts. Pick-up and delivery service is available for a fee. Call us to schedule an appointment. A full line of Nitro-Phos fertilizers and products is available to help you keep a healthy and green lawn. We carry specially formulated fertilizers for olive trees, fruit and nut trees, flower beds, shrubs and ornamental trees. Bermuda grass and Winter Rye seed is also available. Agroland Equipment & Supplies is proud to be part of the Green movement in Austin. We are helping our customers become more eco-friendly by offering a selection of battery-operated, zero-emission equipment. Let our experienced sales staff answer your questions and help you find the right equipment for the task at hand for, home, ranch, or business. We are convinced Agroland Equipment & Supplies will become your only stop for all your outdoor power needs.